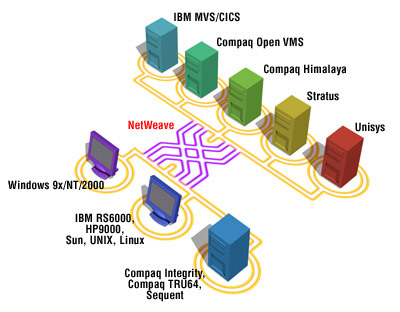 NetWeave is a broadbased middleware product that allows companies to interconnect their otherwise incompatible legacy computer systems and to open them up to today’s modern technologies of workstations, LANs, and SQL servers. NetWeave supports the high performance, scalability, reliability, and data integrity demanded by today’s mission-critical, distributed applications. NetWeave enables a program on one machine to talk to programs on other machines and to have access to remote data just as easily as if those remote programs and data were local to it. A Windows-based order entry system, for instance, may need to obtain customer information and to update billing information held by an IBM financial system. Additional features provide peer-to-peer messaging services to link applications across the network, thereby allowing developers to build their own client/server and peer pairs. Client/Transaction Services allow a client application to send a complex, interactive transaction to a remote application server. Message Queuing Services guarantee delivery of transactions and other messages even in the face of server or network failures. Message Broadcast Services provide synchronization among numerous remote applications. Client/Database Services allow a client application to directly access and update data in foreign proprietary file systems and in SQL databases. Transaction Services ensure consistency of all data bases. Data Conversion Services reconcile data format differences between platforms. Security Services ensure controlled access to the application and its data. Directory Services allow data and servers to be freely moved about the network. File Transfer Services transfer files around the network. Remote Spooling Services allow a client to take advantage of a remote spooler to deliver text files to a remote printer, file, or application. Dual LAN Support connect network applications to servers over two LANs.